the Ahwanee Inn on Christmas Eve. 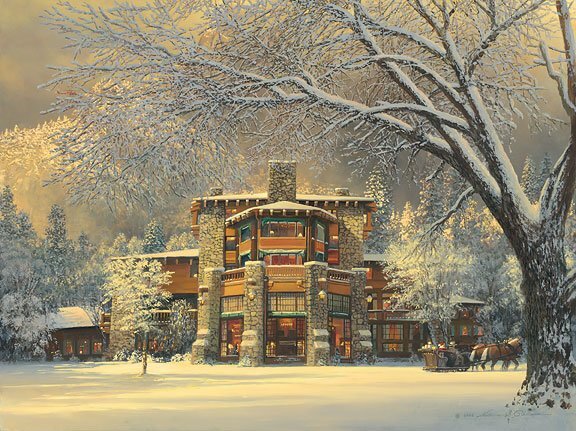 As the fourth in the “Inns of Christmas” series, William S. Phillips captures the spirit of the season, as well as a glimpse of Santa, with "Christmas Eve at the Ahwahnee." Christmas magic has created collector magic, making Sold Out editions of "Christmas Eve Delivery," "Christmas Eve at the Winchester Inn" and "Winter Visitors at Kringle Hill Inn." Imagine Santa’s joy while flying over our national treasure of Yosemite National Park and arriving at the majestic Ahwahnee Hotel. This National Historical Landmark represents the great American outdoors and is known for its granite façade, striking beamed ceilings, massive stone hearths and richly colored Native American artwork. Although beautiful and elegant in any season, the Ahwahnee is especially stunning in winter. Each December, the Ahwahnee hosts the Bracebridge Dinner, a feast of food, song and mirth. The holiday season, with its great pageantry and a sumptuous feast fit for a king, is an event even Santa wouldn’t miss.